Technical Car Experts Answers everything you need: Fuel pump not working on 1991 Ford Ranger? This types of problem causes no start issues on car. The car will not start,due to fuel pump not running. The fuel pump is controlled by the fuel pump relay through ground switching by the PCM (computer) . Let start by taking a 12 volt test light and see if you have key on voltage at the fuel pump relay on the black/yellow as well as the red wire, check this and confirm. 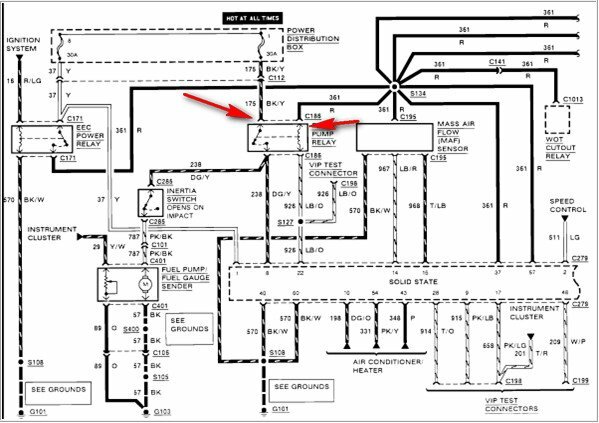 On the fuel pump relay, the red wire power comes from the EEC relay and the black/yello comes fron the #1 fuse in the under hood fuse panel. The lite blue/orange is the ground from the PCM amd the dark green/yellow is power out to the fuel pump. If you have power on black/yellow wire and red wire.Then take a ground wire and try grounding the Light blue/orange and see if the pump runs. Also with light blue/orange wire grounded the key on do you then get power on the dark green/yellow wire? 1) If you have power on the red and the black/yellow and the PCM is grounding the lite blue/orange wire and nothing coming out of the relay on the green/yellow then that would mean the relay is bad. 2) If you have power on both power wires and the PCM is grounding the relay it should power the dark green /yellow wire, does the pump run if you apply battery voltage to the dark green.yellow wire? The dark green/yellow wire is the fuel pump feed wire that goes to the inertia switch and then the pump. It should run if powered up if the inertia switch is not tripped and the pump has a good ground. If your power the dark green wire at the relay and it dosnt run then you are eaither open to the pump or the pump is defective. With the dark green/yellow wire powered up see if you have 12 volts in and out of the inertia switch and also at the pump.